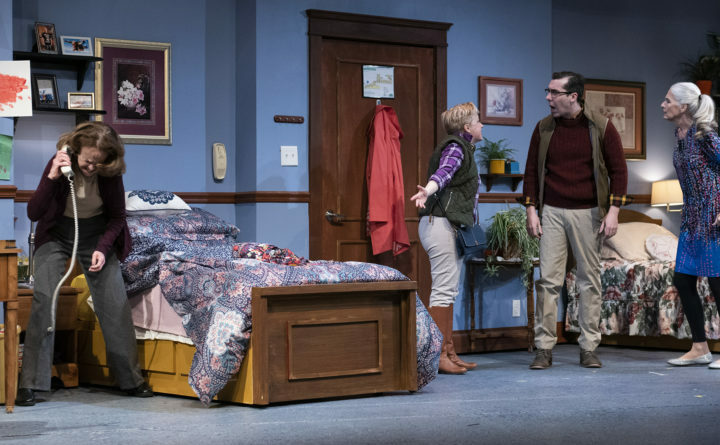 The cast of "Ripcord" at the Bangor Opera House reacts as Abby (Danielle Kennedy, left) and Marilyn (Sara Morsey, far right) ratchet up their be with the help of Derek (Brad LaBree) and Colleen (Jennifer Shepard). Marilyn’s a chatty optimist. Abby’s a bitter pessimist. Put these aging opposites together in a retirement community and comedic silliness will ensue. There could have been more to David Lindsay-Abaire’s “Ripcord,” the latest offering from Penobscot Theatre Company, but there isn’t. The playwright made his mark with the hysterical farce “Fuddy Meers” and won the 2007 Pulitzer Prize for drama with “Rabbit Hole,” a deeply moving story of loss. But in this show he just wants an audience to have fun watching Marilyn and Abby try to one up each other. Producing Artistic Director Bari Newport, who directed the show, wrings every laugh possible out of the dialogue. She is aided by a talented and experienced cast and skilled designers behind the scenes who work seamlessly together to keep the action moving and the laughs rolling out over the audience. By Thursday’s night’s performance, the cast and crew of “Ripcord” appeared to have recovered from the opening night mishap when a prop that was supposed to be filled with water turned out to contain a substance suspected to be pepper spray. That sent an actor offstage in agony, made nearly every audience member cough and forced Newport to issue an apology and replacement tickets to theatergoers. Veteran performers Danielle Kennedy as Abby and Sara Morsey as Marilyn lead a stellar cast that made the most of Lindsay-Abaire’s silly patter and ridiculous situations set off when the roommates make a bet. Although the characters tend to box with each other verbally, Kennedy and Morsey’s interactions are more of a tango than a rope-a-dope. Kennedy, who gave a searing and unforgettable performance as Violet in PTC’s 2015 production of “August: Osage County,” gives Abby a bit of that character’s bitter wit but allows the former grade school teacher a softer edge. The actress’ timing is perfect in delivering Abby’s razor-sharp zingers. Morsey captures all of Marilyn’s sweetness and enthusiasm for life. The actress ably portrays the scheming practical joker who always has a contingency up her sleeve. As Scotty, the employee/negotiator who tries to broker peace between the women, Allen Adams is delightful. Always a good straight man in comedies, he gives one of his best performances in “Ripcord.” His awe and outrage over these women’s antics fuels theatergoers delight. Brad LaBree, Ben Layman and Jennifer Shepard round out the cast playing multiple roles. Layman is especially good in an emotional scene with Kennedy. Their confrontation about the past rings true and provides the most true moment in the play. LaBree, who received the dose of suspected pepper spray, deserves credit for soldiering on after such an unexpected and traumatic onstage accident. Patrick Rizzotti’s set is functional and flawless. It looks like a lot of shared rooms in assisted living facilities but it magically breaks open to reveal a haunted house, the inside of an airplane and a park bench. The lighting design by Jess Fialko compliments the set perfectly. The sunlight coming through the window coveted by Marilyn and Abby is a constant reminder of what the bet that drives the plot is about. Properties designers rarely get a mention, but Belinda Hobbs did an outstanding job of decorating each character’s side of the room. Marilyn’s busy bulletin board, her family photos and cozy bed covers contrasted with Abby’s caderie of plants and nothing to connect her to another human being, defines the characters from the moment before the play starts. “Ripcord” is a harmless, funny show that won’t make audiences think too much about Maine’s aging population or how it will be cared for. According to Newport and Lindsay-Abaire, old age is going to be fun. “Ripcord” will be performed through March 31 at the Bangor Opera House, 131 Main St., Bangor. For ticket information, call 942-3333 or visit penobscottheatre.org.